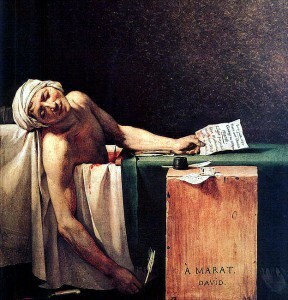 David's good friend and journalist Jean-Paul Marat was murdered in 1790 by a woman who hated his sympathy for the French Revolution. 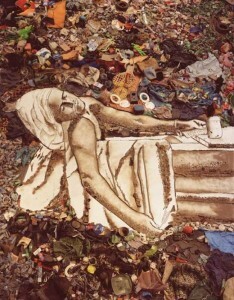 Vik Muniz's version of David's painting uses recycled Rio de Janeiro trash. 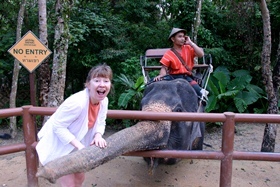 I have now completed my Humber Course! What a wonderful, intense three semesters. A film we saw on the last day of my International Development course really summed up much of what we learned throughout the year. “Waste Land,” a 2009 Sundance winner, followed Brazilian art star Vik Muniz as he created a series of works focused on the garbage pickers in the world’s largest landfill in Rio de Janeiro. I could almost smell the brown sludge as it poured from the back of dump trucks and I cringed as pickers waded through the stinking mess to harvest recyclable plastics and metals. At first it seemed the catadores (trash pickers), weren’t people but faceless drone workers. But as the film unraveled we met a beautiful young mother, an optimistic catadore leader, a stoic cook, and many others who had stories all too human to share. Most were there because they wanted to make an honest living and avoid the favela districts’ only other alternatives, drugs and prostitution. Muniz photographed them in classic art poses (such as the slumped figure in Jacques-Louis David’s “The Death of Marat”), recreated the pictures on a huge studio floor using recycled materials from the dump, then photographed the studio floor. The resulting portraits were stunning, full of strength, dignity, and a profound sorrow. Just writing about it makes me want to cry, but this film wasn’t unhappy. In the end it was uplifting and hopeful. Muniz sold the pieces at auction, the first one fetching $50,000, and gave the money back to the catadore community. At first I was leery of Muniz, thinking he would make his art and just walk away. He didn’t and over three years we started to see the pickers in the film start to blossom with future aspirations. 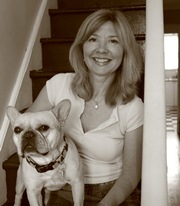 They were courted at gallery openings and their self-esteem started to build. Tiao, the leader, told a TV interviewer, “We are not pickers of garbage, we are pickers of recyclable materials.” Muniz’s money went towards a sustainable catadore recycling center. Director Lucy Walker focused on the collaborative relationship between Muniz and the pickers. He was the famous artist, but their resilient spirit was at the core of his work, and it ultimately propelled their lives. It reinforced the big lessons of the year for me: building capacity, whether through art or education, is all about lending hope so people can see their own strengths and capitalize on what they know will work best for them. A wonderful, and surprisingly inspiring film. This entry was posted in Humanitarian and tagged Brazil, Documentary, Vik Muniz. Bookmark the permalink.